When I first bought a computer you could have any colour case as long as it was beige. Then black became the new beige, but saying that the black cases are far more stylish than the old beige box. Desktop’s are out of fashion unless you’re buying for business and different flavours of tower cases are the only real choice for the discerning PC enthusiast. Though there are a few cases out there in white and few other colours, but I choose functionality over form. The last time I did a full build with an i7 920 at its heart I choose an antec case. A black Arthur C. Clarke type monolith, which was built like a tank and was not easy transporting around, especially after I had added a large CPU cooler, the whole rig weighed over 20 kg’s. It did have a big glass side panel, so I could view all the shiny lights on the inside, but the important thing is it kept my computer cool. The above picture was taken before the Phase II build. But that’s the present location of my PC, yes it is next to the radiator, but seen as that radiator is not switched on everything is fine. Hopefully before it comes to winter I will be able to afford a desk, chair and new monitor, as well as the graphics card I sorely need. With all the other considerations the last one was I wanted some USB 3 connectors on the case. With Z170 cases all having USB 3 I wanted to be able to access them easily for when I get a case mounted into a desk! Things I was not concerned about, A windowed side panel! I did not want something too flashy, especially something that leaked light into the lounge. Partly cause I like things to be understated and I also don’t live in that nice an area. I live on the ground floor and people take short cuts near my lounge window so I have my TV, XBox and PC so it’s not visible from either the window or the door onto my veranda. I wanted my play area to be private and concealed! After much consideration I settled for Fractal Designs Define R5 Black. From descriptions it met my needs and had a focus on been a quiet case. With sound deadening material added through-out the case. 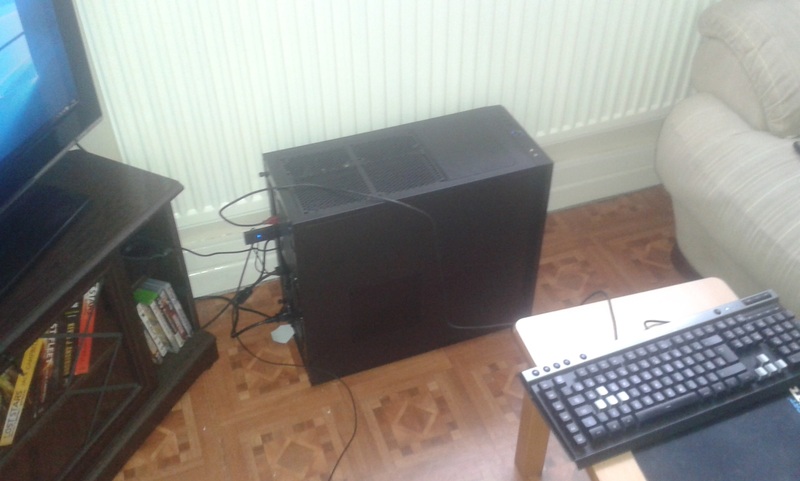 When I bought the case it cost approx £80, which was a lot less than the Antec I bought for £200 in ’09. I was worried about the build quality and the case feeling flimsy and the plastic parts not fitting or been cheap. I need not have worried! With some cheap cases I’ve noticed that the box can twist and flex unless everything is fixed into the case. This did not happen with the R5. 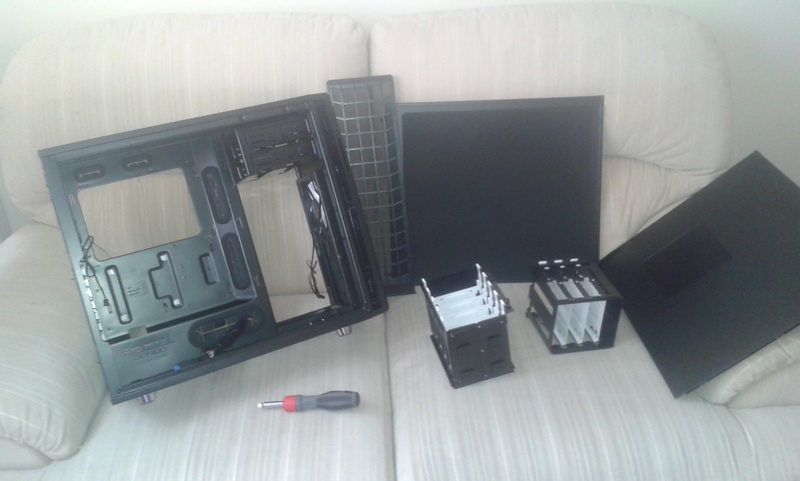 Taking the case all apart, making sure to save all the screws. Even with everything removed except the 5.25″ drive bay the case is rock solid with no torsional twist noticeable. I also like that both side panels are accessible without a screwdriver. Both side panels have a big wad of material on them to deaden sound. The drive cages are easy to remove and also relocate if required. 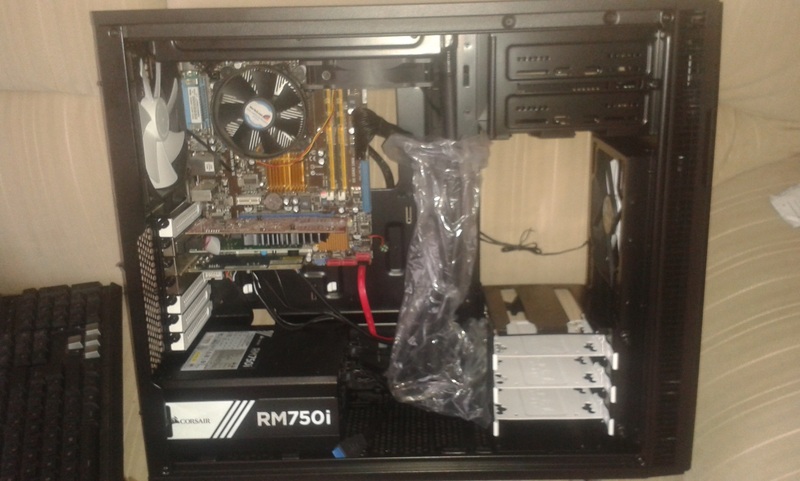 In the above picture you can see I’ve now added the power supply, I have both case fans mounted, in a front mounted pull and rear mounted push configuration. I have the bottom mounted dust cover removed and you can see the area to mount a bottom mounted fan. The case can be powered by a SATA power connector and can have upto 3 fans attached to it and these can be controlled via a controller on the front offering 3 speed settings. At present I’m not using this feature as the fans are all been driven via the motherboard. As the case has plenty of mounting slot’s it could be useful if you motherboard is lacking in fan mount headers, for example mini-ATX boards. From the above picture you can see there are plenty of places for wires to disappear and then reappear were needed. The above picture is from near the end of the build process and is called cable tidying which should be better defined as cable hiding! 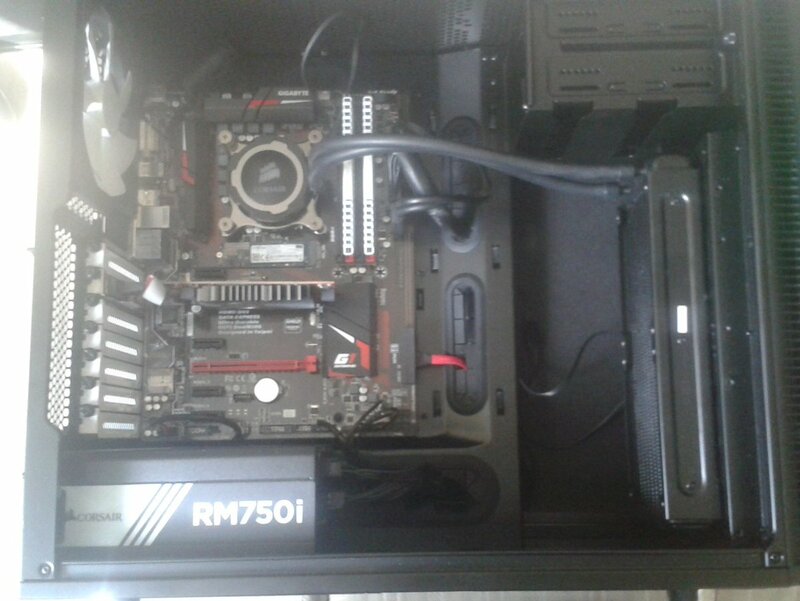 There is plenty of room behind the mother board to route cables, removing the need for cables to snake across the motherboard, which just gives you a cleaner looking build even if you cant see it. The overly exsposed white area is the SSD mounts. The SSD mount was the only area that caused me a problem. All the SATA power connectors have a 90 degree bend in them, but due to the mounting plate and area I could not power the SSD’s in this loaction. My orginal work around was to use a molex to SATA connector that did not have a 90 degree bend in it. But that meant having a molex lead from my PSU. I was trying to banish legacy ‘things’ from my build! So I ordered a SATA power extension online, at the same time I bought a long ethernet cable so I could retire my WiFi adapter. Once this arrived, no more molex and a happy builder. This was the only problem I came across in my whole build. I had lots of fun trying the fans and water cooling resevoir in many different locations. The case went through many iterations, here you can see a roof mounted radiator with one fan, and a push pull case mount fans. With a roof mounted radiator I removed the covers for the top vents, this is a nice feature. If you are not using the top fan mounts to exhaust the hot air you can cover the vents with plates which have the sound deadening material to help make the case quieter. Another option that I like but wont really use is that you can alter which side the door hinges are on. A little feature but can be a big deal if you have a case located next to a wall and the door hinges the ‘wrong’ way and makes it difficult to access an optical drive. The above picture is with full cable tidying options used, no 3.5″ drive bays and the radiator mounted on the front panel drawing air in through the dust filter. You can see that there is plenty of room for a big graphics card, like a GTX Titan X. 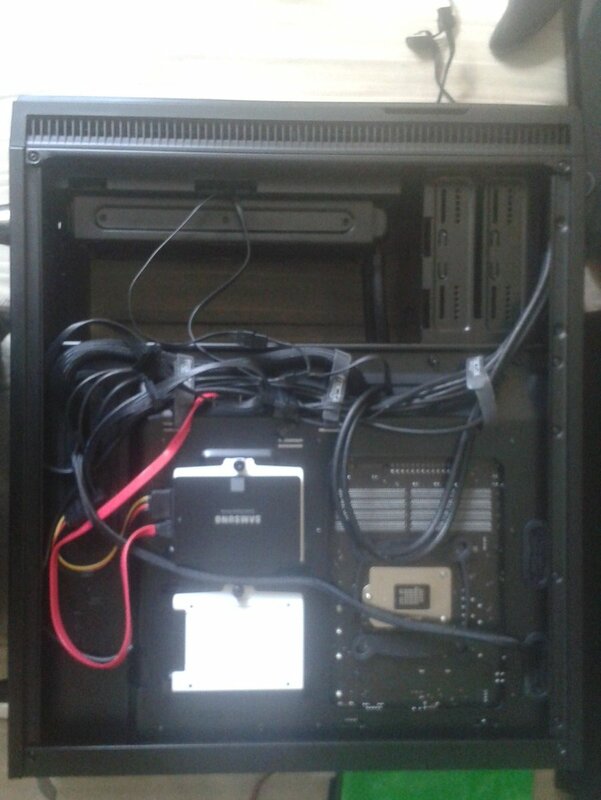 There is room for a full custom water cooling loop and reservoir once the drive bays are removed and with a potential of 2 SSD’s mounted behind the motherboard and depending on your MOBO at least one M.2 slot this could be the first case you get where you no longer need a hard drive. As everything you buy on building a PC gets attached to the case, it’s important that you research and get something suitable for your needs. Researching cases is not as fun (for me anyway) as looking at the more shiny bits of kit like CPU/GPU or MoBO. But for me the case is the foundation of the build and a getting the right case with the right features can be a good start in a build process. Or for you it might need to ‘Look’ right. Many cases now are not monolithic with features that are immoveable and set, case designers have realised that one type of case can suit many different needs so spending time deciding what features are important to you and what are not can help you build the machine you want. If for instance you wanted something to look more visually impressive, I could have gone with the R5 with the glass side panel, to show off the LED’s on my MoBo and the lights from my water cooling loop. A solidly built case with useful features. Well thought out layout with a lot of customizable features and the only minor problem was with the interaction between my PSU (a Corsair RM750i, this is a popular brand and model of power supply) and the SSD mounting point. I feel that this one point does not detract from this excellent case one bit. Even if I knew about this problem I would still have bought the R5! 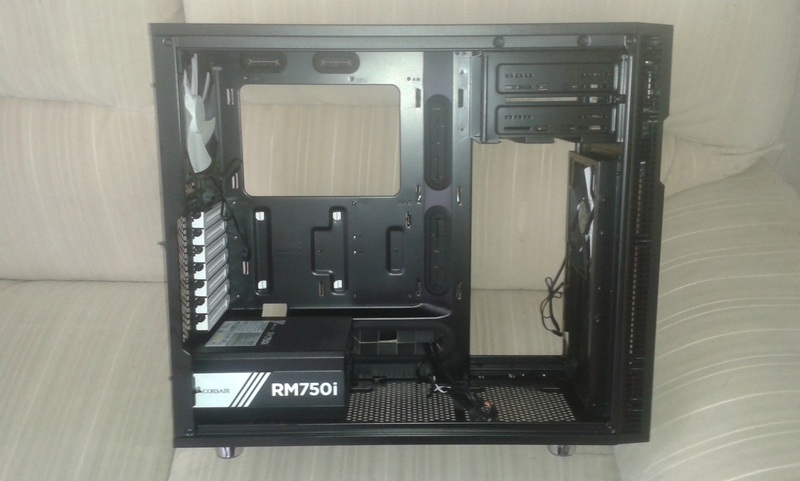 This entry was posted in Review and tagged blog, build, define r5, fractal design. Bookmark the permalink.